The course is almost finished. Admittedly, I’m in sore need of a respite from the pressure of end-of-the-course classes, but it’s also true that I have a lot of ideas to try and share sitting on the drafts shelf of my mind. Little by little they will see the light. My students struggle with English spelling. Who doesn’t? Little by little I can see they’re making progress, but unfortunately there are some spelling mistakes that I keep finding in my student’s exams. 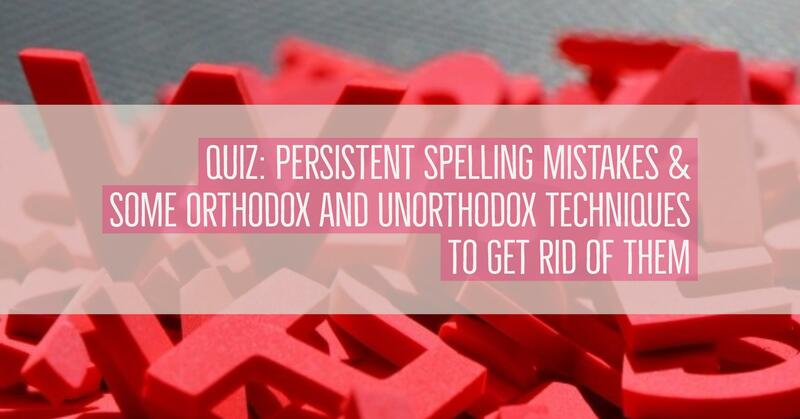 A quick search on the Internet reveals that the occurrence of these spelling mistakes has little to do with your mother tongue though, admittedly, the quiz is based on my students’ spelling mistakes who are, for the most part, Spanish. What about you? Do you also make these mistakes? Let’s find out! Write them down. This is the dull, traditional but effective way of correcting spelling mistakes. Start with one mistake and write it down, at least 10 times. This was my mother’s favourite method. I guess it served two purposes: to help us learn the correct spelling and also to keep us quiet for a while. I can’t blame her. I have 4 siblings and there are 6 years between the youngest and the oldest. Do the quiz. Do it once and write down all the targeted words you can remember. Take the quiz again. Correct the ones you misspelled. Repeat procedure. Ask someone to help you. Write a list of the words you have trouble spelling. Write the translation in your own language next to each one. Ask someone in your family to call any of these words at random. Write them down and ask this person to correct them. Once you have mastered the spelling of the words, you might want to buy your helper a drink. He deserves it. Write a short story. Write the words you seem unable to spell correctly. Make sure you write them down properly. Read them several times. Write a short story containing them and give yourself a high five if you got most of them right. Warning: don’t ask anybody to read it. The story will probably not make any sense at all. Stick on the walls of your house flashcards with the correct spelling. I used to do it with phrasal verbs when I was at uni. It worked but my flatmates were not very happy. Use Quizlet or any other app to create flashcards. This app is great to work with spelling as it offers a variety of games to practise the correct spelling. I’ve made a short video tutorial. See it below.